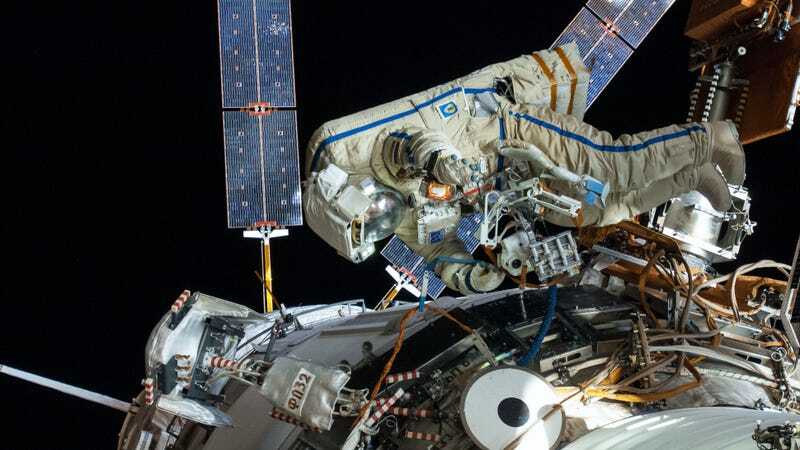 According to cosmonaut Oleg Artemyev, the Roscosmos contingent aboard the International Space Station had it slightly tougher in training than their American counterparts. I, a reasonable person who is terrified of heights, find his anecdote from cosmonaut training to be completely terrifying. ﻿Unfortunately, the U.S. astronauts do not this component of training, but the Russian cosmonauts undergo a parachute training component. The training is designed to reduce the fear level of the crew members. It’s not easy. You arrive…and you’re handed a problem to solve in your hands. Then you go up and they push you out of the flight vehicle and you have to stabilize yourself. They record you on your helmet and you have the problem in your hand that you need to solve. The first time [you do this], the psychologist who monitors your flight hears just “oik!” and “yike!” and “oops!” Then as you progress through the training, you’re able to provide a running commentary during your flight as you’re able to work out the problem and slowly, step-by-step, the fear level is reduced. That is the goal of the training. That is all done prior to the parachute opening. You need to solve the problem prior to opening your parachute. Nope? Nope. Yeah, nope. I’m perfectly good never, ever having to do this. If you toss me out of a plane, my inner giant chicken wants to open that parachute as soon as I can.